Cycling is exciting and fun to watch. We think so too! To enhance the experience even further, we designed some free cyclingcompetitions for you to enjoy. Many who know us have expressed their increased addiction to cycling after joining one of our online cycling games. So, have a go, give it a shot! At worst, you'll start appreciating professional cycling even more than you already do. Who knows, you might even be good at predicting the outcome of stages and get eternal glory afterwards! To start off in this Main Team Competition you can design your own cyclesquad. Your squad, called “Main Team”, will consist of 65 riders. 28 Out of these 65 riders will represent your squad during the race. You can freely choose riders from any participating team, no restrictions. After the deadline and screening of the teams, your selection of 28 riders will be your “Raceteam”. Every stage you’ll be able to select a maximum of 15 riders from your Raceteam into your “Startlist” for the race. 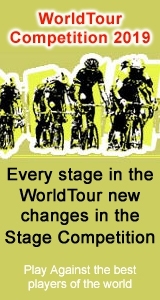 The Stage competition enables you to design a squad of 12 cyclists for every stage. You can compose your dayteam till 15 minutes before the actual start of the stage. Based on your stage ranking you will receive point for the general classification. A competition based on a different points system for people with less time. In this one you have to select 20 riders for the whole race. You only fill in a team once and there you go. The competition is a little more static, but the points reward should challenge you.